I wish I had known how to make this a lone long time ago. I learnt it only when my MIL was here and I am loving it. 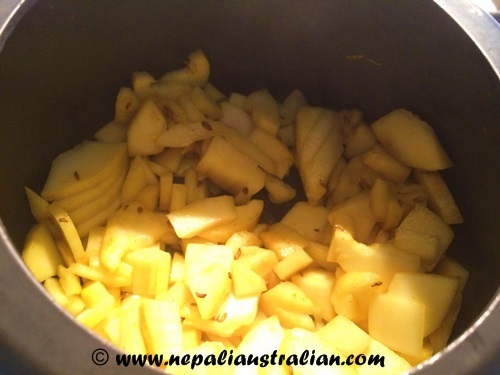 It is the best alternative for laspsi ko achar as lapsi is not available here in Australia. 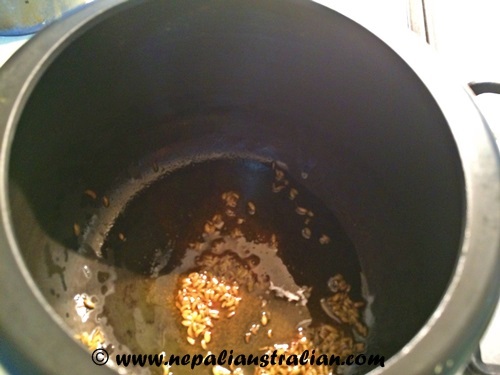 Heat oil in a pressure cooker (use heavy bottom pan if you don’t have pressure cooker) and add fennel seeds. 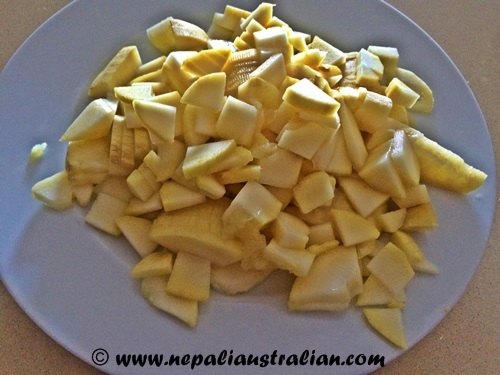 Add mango cubes and fry for about 5 mins. 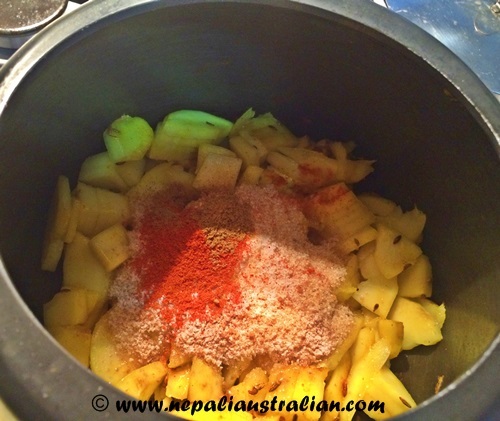 Now add the sugar, chilli powder, coriander powder, turmeric powder, asafoetida, black rock salt and salt and mix with the mango cubes. Add a cup of water and close the lid and cook till 3-5 whistle of the pressure cooker of if using a pan then cook until tender. 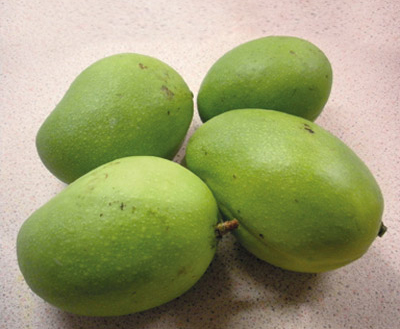 The achar is done when the mangoes become tender. The achar should be thick, not runny. If it is too thin, let it boil for a while until you get the desired consistency. This is great to keep for few days in fridge. 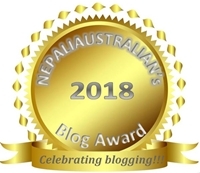 This entry was posted in Foodie, Recipe and tagged achar, asafoetida, australian nepali, Birae Nun, kathmandu, love, M from nepaliaustralian, Mango, Nepal, Nepalese wedding, Nepali, nepali australian, nepali food, Nepaliaustralian, newari, newari food, pickle recipe. Bookmark the permalink. 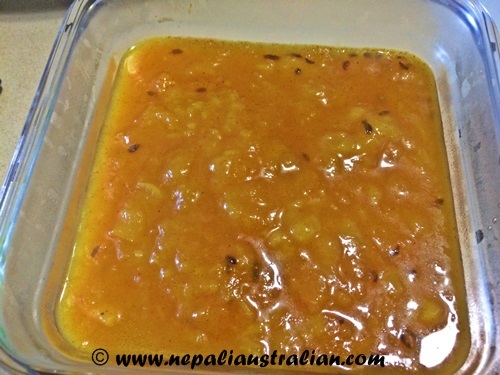 My dh is Bengali, so I have made gur aam…a sweet and spicy mango pickle. I don’t even know why though, because we never eat pickle. Ha! This is my favourite pickle!! !